From 1st. May to 30th. 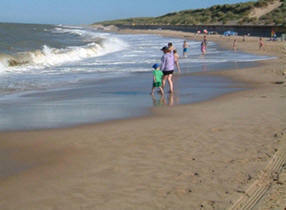 September dogs* are not allowed on certain parts of Palling beach. The area concerned runs from the LEFT of the ramp next to the Lifeboat Station (as you look out to sea) for about 520 metres to the second crossover onto the Marrams. Dogs are also required to be on a lead (less than 1.8 metres long) when on the ramp and the crossovers to the beach. These regulations are in accordance with North Norfolk District Council's "The Dogs Exclusion, Beaches Order 2007" and " The Dogs on Leads, Beaches Order 2007". Penalties for non-compliance range from £80 fixed penalty up to £1000 on conviction. *Please note that this ban does not apply to registered assistance dogs. The maintenance and checks are now being undertaken by the lifeboat crew, all of whom have had the appropriate training. If there are any issues or if it has been used then please e-mail info@seapallinglifeboat.co.uk or contact any member of the crew. It is situated at the Toilet Block adjacent to the ramp at the top of Beach Road. No previous experience necessary as full training will be given. All we require is enthusiasm and a level of commitment. If you are interested please contact the Coxswain on 01692 598487 any Thursday from 19.00 to 21.00 or Sunday from 09.00 to 12.00. Alternatively pop along to the boathouse during these times or contact info@seapallinglifeboat.co.uk You'll always be made welcome. HELP REQUIRED! Would anyone who is interested in fundraising please get in touch and help us raise money for this very necessary life-saving service. Since we do not receive any grant from the Government nor funds from other rescue services, we have to rely on ourselves and the public's generosity to continue. Any ideas or help would be greatly appreciated. Appointments may now be made for the Blood Service's visit to Stalham High School on Wednesday 24th. October. These may be made either on-line at www.blood.co.uk or by telephoning 0300 123 23 23. Please do not get too close and keep dogs on leads. There are some allotments available for hire in Palling. Annual cost is £30 for a full plot, £15 for a half and there are also a few free small ones for young people (U16). Further information from Tony Brunning on 01692 598037 or Tim & Jane Hodge on 01493 393562. Booklets giving full tide tables for this area may be purchased from Sea Palling Post Office & General Store. Below are the dates and times at which high water tides greater than 2 metres (m.), predicted at Wells Quay, will reach Palling. It is possible that tidal surges could occur at other times if weather conditions are unfavourable. In particular, northerly winds increase the risk of flooding on the coast. Most tidal flooding occurs when there is a tidal surge, so the timings below then become academic and are only to be used as a rough guide. Times are for Palling (Waxham please add one minute) All times: BST.